ClubCoins Necesarios: 234 Please note that, for now, you cannot download content from our platform directly onto a mobile device (phone, iPod, iPad, tablets...). You need to download your items onto a PC or Mac, and then transfer them onto your device in the normal way. We are working on allowing direct downloads to mobile devices but this is not possible in the current version of the platform. Sorry about the inconvenience! 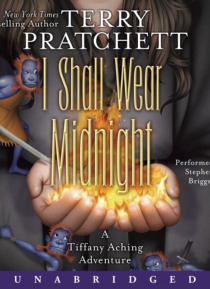 The fourth in a series of Discworld novels starring the young witch Tiffany Aching.As the witch of the Chalk, Tiffany Aching performs the distinctly unglamorous work of caring for the needy. But someoneor somethingis inciting fear, generating dark thoughts and angry murmurs against witches. Tiffany must find the source of unrest and defeat the evil at its root. Aided by the tiny-but-tough Wee Free… Men, Tiffany faces a dire challenge, for if she falls, the whole Chalk falls with her. . . .